Arctic-ulate is a unique, multi-media show inspired by the science and heritage of the polar environment. Written and performed by the Polar Poets, Susan Richardson and Siobhan Logan, it interweaves poetry, performance, story, music and images into a vivid one-hour piece of theatre. In the process, themes such as the history of polar exploration, the myths of the aurora borealis, and the fragility of the polar landscape at a time of climate change and increasing industrialisation, are also addressed. Both writers have travelled throughout the Arctic and experienced the polar landscape at first hand. Arctic-ulate has toured science festivals throughout the UK, from Manchester to Wrexham to Saltaire, while Susan’s solo version of the show has been seen at Bristol Big Green Week and at the ONCA Centre for Ats and Ecology in Brighton. So much work has gone into this show – it was brilliant! As a polar buff, this was right up my street. Really interesting. Two lovely, clever, committed women – thank you! Brilliant mix of poetry, science and history. Very informative and thought-provoking. 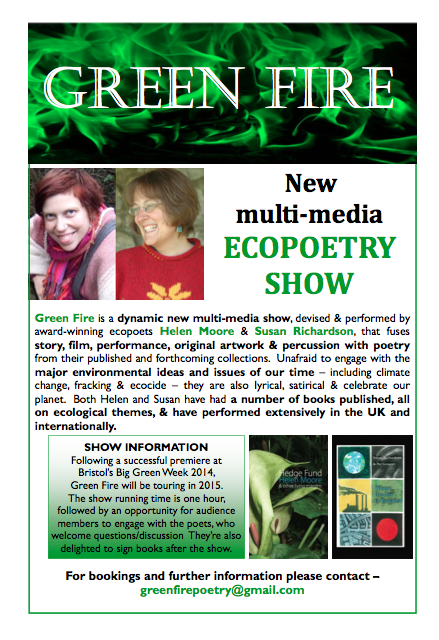 Since 2014, Susan has been collaborating with fellow poet Helen Moore on devising and performing a multi-media ecopoetry show, Green Fire. Fusing story, film, percussion and original artwork with poetry from both writers’ published collections, the show was first performed at Bristol Big Green Week, in association with the Bristol Festival of Ideas. Susan and Helen have since taken Green Fire on the road and have performed it in a wide range of venues from meeting rooms in pubs to an atmospheric chapel in a cemetery to the Frome Festival. A whole range of critical issues, from ecocide to climate change to fracking, are addressed during the course of the show, and a post-performance discussion/Q & A with audience members is always encouraged too. 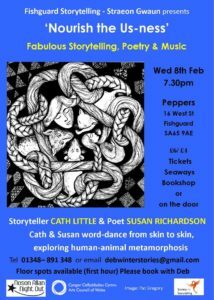 Nourish the Us-ness is a new collaborative performance, themed around human-animal metamorphosis, featuring poetry from Susan and story and song from Cath Little. 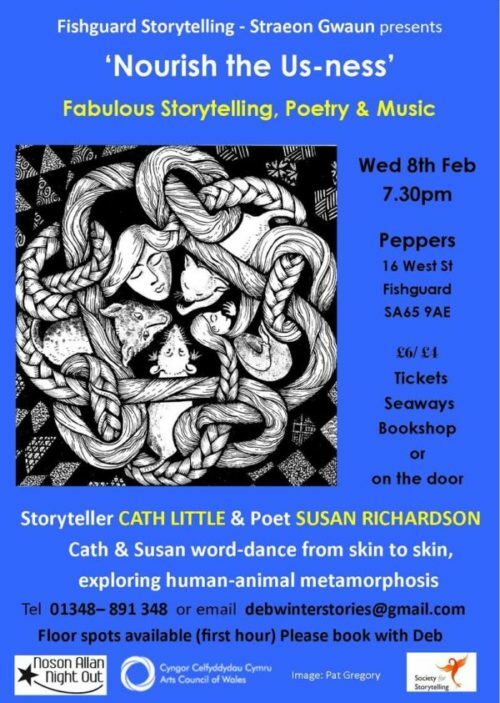 Meet a lion-man, a daughter who transforms into a deer, and hear the watery whooshes of a Celtic seal-woman as Cath and Susan word-dance from skin to skin, exploring both our intimacy with, and alienation from, our animal selves. Nourish the Us-ness has been performed at Chapter in Cardiff, Peppers in Fishguard and at the Dylan Thomas International Summer School. Further dates are being added for 2018. 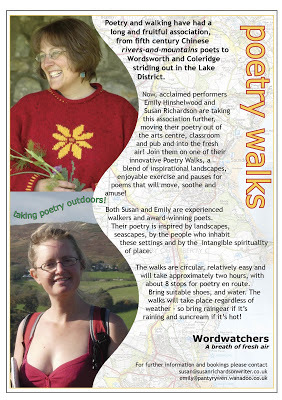 Poetry Walks, a project that Susan has developed alongside fellow poet-performer Emily Hinshelwood, is a blend of walks through wild, inspirational landscapes and pauses for poems that move, soothe and amuse! In their mission to move poetry readings out of the classroom and arts centre and into the fresh air, Susan and Emily have led a range of walks in Wales, the West Country and beyond, with plenty of stops for participants to enjoy performances of their landscape-inspired poems en route. They have particularly enjoyed their many summer bookings, including the Uncivilisation and Wilderness Festivals. Susan also leads solo Poetry Walks. During her residency at the Dylan Thomas Boathouse in Laugharne, she offered a number of peripatetic poetry events. Audience members joined her for wanders through Laugharne’s woody and watery fringes where she performed poems on environmental and wildlife themes, wilderness and metamorphosis from her published collections.